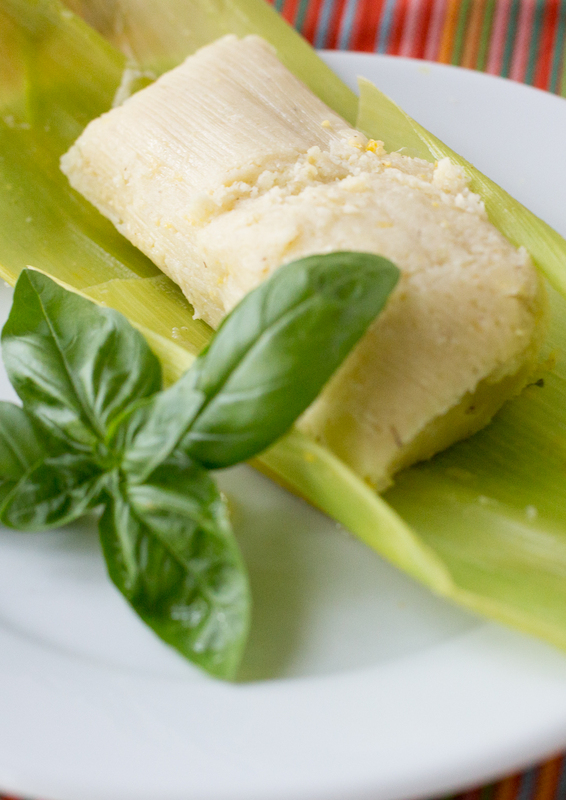 Chilean Humitas are similar to tamales but made with fresh corn instead of masa. In my family, at least a couple of summer weekends were dedicated to cooking Humitas to freeze and store for the winter. The precise moment is when the right variety of corn, call “Humeros,” and the basil is abundant and cheap, but before the corn is over ripen and turn dry. Always check the corn; it should look milky. It is not necessary to do everything in one day; you can cut and match the leaves of the corn and leave the mixture ready the day before. The next day made the humitas and cook. Serve with an excellent Chilean salad. Or a few slices of real tomatoes, a true ode to the Chilean summer. Maybe you’re interested in the recipe: Corn Pie. Cut the base of the corn, separate the leaves and reserve the large leaves and arrange them into 16 pairs of similar size. Finish peeling the corn and remove all threads. 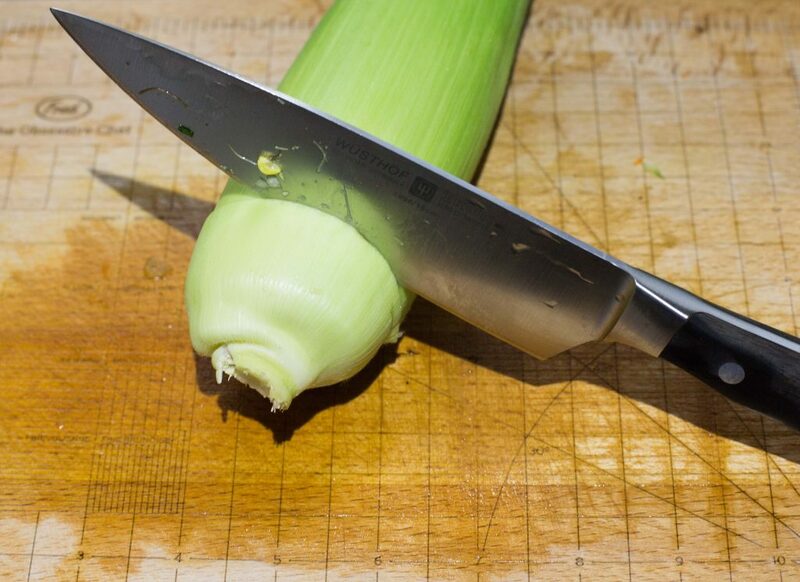 Using a large knife, shell the corn, you can do it in one pass and then pass the grains through the grinder or food processor. Or in several passes (2-3) so that the grain is finely chopped, do it as seen in the photo to keep all the juices or milk of the corn. If using frozen corn, grind it on the food processor without defrosting, use the milk called in the recipe if you need to add some liquid. In a large pot, hopefully with a thick bottom, heat the butter or the “color” and add the onion, brown for 8-10 minutes stirring occasionally. Add the paprika, salt, pepper, and peppers. Stir. Add the corn and milk, stir well and let it boil, and thicken, add the basil and pork rinds if desired. Add the cornmeal if it is necessary to thicken more. The mixture should be firm. Place three or four large spoons of the mixture on the open leaves. Fold first on the sides and then the tips inwards. Tie with twine and give it the traditional bowtie form. Boil abundant water with salt in a large pot. Cook the humitas submerged for 30-40 minutes. Serve hot, cut the twine on the table. Serve with Chilean salad.